The ability to rapidly test a vacuum tube to assure that it will probably function in a circuit is fairly easy. What's difficult is to accurately measure any vacuum tube's transconductance and to have full confidence that the "tube under test" will function in any type of circuit at any frequency. All vacuum tube testers are compromises that combine manufacturability with "ease of use" along with some degree of accurate measurement of either cathode emission or, the more difficult to measure, transconductance. No tube tester is 100% accurate for all tube types or for all functions of that tube in a variety of circuits. No tube tester can find 100% of the faults that are possible in a tube under test. However, tube testers do a good job at sorting out tubes that are functional from those that have minor to catastrophic failures. The "final test" is always to see how the tube performs in the actual circuit that it is intended to be used in. Thoriated-tungsten filament vacuum tubes can become weak in emission if they are not operated for a long period of time. The thorium atoms that are in the hardened "paste" that is the coating on the pure tungsten wire filament tend to migrate to the lowest part of the coating. This reduces the filament emission. By heating the filament up to its normal operating temperature the thorium atoms will migrate back up to the surface of the paste (which increases the emission) but it can take a minimum of thirty minutes for the tube to regain its former operating gain. Some radio repairmen didn't have time to wait so the Sterling Reactivator allowed them to speed up the process. By elevating the filament voltage by two times for 30 seconds and then allowing a "burn in" period at 1.5X the filament voltage for 5 to 10 minutes, usually the tube would respond with a measurable increase in gain. The Sterling Reactivator does provide a "Test" function to monitor the results. This device can only be used with thoriated-tungsten filaments. Pure tungsten filaments will not reactivate. Also, DeForest tubes used a carbon based filament that will "burn out" if reactivation is attempted. Only 01A tubes and UV-199 tubes can be tested and reactivated with the Sterling Tube Reactivator. Since the act of "reactivation" does involve some risk to a potentially good tube, I don't ever use this device. If you merely install the "weak" tube into the radio and operate the radio normally for about 30 minutes you will notice that the gain and sensitivity will have improved. Further operation will also show more improvement over time but the greatest gain increase will be in the first 30 minutes. Patience rewards you with safely reactivated tube. Also, once a tube is reactivated, it takes a very long time of "non-use" for the tube's emission to decrease again. I don't have the manual for this tester to see what was expected as far as light patterns or how to determine the tube's performance by lamp brightness but one can assume that unless the tube being tested matched the specified pattern and/or the brighness, it was considered bad. Using the Preceptor Tube Tester must have provided the radio repairman with a way to sell lots of new tubes. This Preceptor Tube Tester came from NU6AM. Simpson came out with their "Roto-Ranger" Voltmeter in the late-thirties. It featured an "scale-in-use" type of meter that used a rotating drum with several different scales printed on it. The scale viewed changes as the different switched voltage ranges were selected. That was followed with the Model No. 220 Roto-Ranger Tube Tester that featured an emissions-type tube tester with the additional functions of a DC voltmeter, DC ohm meter and capacitance meter. The circuit of the Model No. 220 uses a triode tube (this one has a 201-A installed) with the grid and plate connected together to act as a diode in order to rectify the AC that is routed to the meter so it will be able to read the cathode current of the tube under test. The cathode current that shows on the meter will be a result of the tested tube's emission and with the proper selected switches the scaling will be correct for the type of tube selected. The operator has to select "Diode," "Battery" or "Cathode" for the type of tube being tested along with the correct filament voltage and the specified tube function level (a potentiometer setting for proper scaling.) Various taps on the power transformer provide the different tube heater voltages and a single winding on the transformer is used for the plate voltage. There is also a winding on the transformer for the internal 201-A tube's filament. Other than tube emission, tube shorts can also be checked and there is a method for checking some tubes for gas. The rotating scale display is mounted in a cast metal housing that entirely enclosed the mechanism and requires major disassembly to access if there's an internal problem. Even with the fully enclosed housing for the rotating scales moisture seems to be able to enter and cause oxidizing damage to the scales. Tube sockets provided are four, five, six, large receiving tube seven pin, octal and loctal. The test leads for the voltmeter are brought out in the storage area above the tube tester panel. That this Roto Ranger Tube Tester has the loctal tube socket dates it to around 1939. There is a data book with this Model 220 that has additional tube information dated 1940. The chart in the lid is original to this Model 220 and has the same serial number as the tube tester, 1360. Simpson produced several models of tube testers from pre-WWII up into the 1950s. The Model 330 is the only Mutual Conductance tube tester the company produced. Introduced in 1946 for a selling price of $98.50, the Model 330 was rather expensive for the typical radio repairman. The purchase could be justified in that, with television coming on strong after WWII, the ability to test a tube and have a measurement of that tube's transconductance based on the tube manufacturer's specifications would be important. The measurement was actually a scale that readout in percentage of mutual conductance (aka transconductance) with 100% being the manufacturer's spec for a new tube. The Model 330 uses a 2.5kc oscillator for grid signal application and claims to test the tube in the manner that it operates in the radio or television circuit. The color-coded meter scale shows 0 to 140% on the top and sections of the scale are marked "Good," "Fair," "Weak" and "Replace." In the "Replace" section is an extra warning to the user - "Caution - May Cause Serious Overloading - Replace." - wow, that must have helped with hesitant customers that balked at buying new tubes for their set. The meter is a FS mechanical zero that is electrically driven to scaled zero when powered up. The multitude of push buttons and rotary switch selectors assured the radio repairman that the Model 330 would always be ready to test the latest and most complicated tubes (with the latest test data hopefully coming from Simpson.) Many of the rotary 0-5 position switches are not even used for the then-popular tubes. When the test is completed the white push button can be depressed to reset all push buttons and all rotary switches back to the start position (which would be 0 or up.) Tube sockets provided are four, five, six, large seven, miniature seven, octal, loctal, noval, acorn and two odd-ball miniature five pin sockets. The Model 330 has an impressive appearance with a stunning black bakelite panel with white-filled engraved nomenclature that probably accounted for many of the sales of the tube tester when new. Some Model 330s have a leatherette covered case while others have the solid oak case as shown in the photo right. This Model 330 was originally owned by "Modern Radio & TV," located at 538 So. Virginia St. in Reno, Nevada. Without a doubt, Hickok produced some of the best tube testers. Hickok testers will actually operate the tube somewhat like it would be functioning in a circuit and thus be able to measure the mutual conductance (also called transconductance) of the tube under test. Hickok had their circuit patented so only a few other makes (that were usually licensed) will operate in a similar manner. These types of tube testers are called "dynamic mutual conductance tube testers" while most of the other types are called "emission testers." Emission testers will measure the ability of the tube to have gain by way of its cathode emission. Though somewhat related, cathode emission and transconductance are different measurements. If you can't measure (or calculate) the transconductance of the tube, then the tester is usually an emission tester. Some mutual conductance tube testers have meter scales that show percentage or an arbitrary scale that is referenced in the test data or roll-chart data for the minimum acceptable readings for a good tube. If it is necessary, usually the actual transconductance can be easily calculated from these meter readings. Hickok built tube testers for several different types of users. For the radio repairman there was the 600 Series along with the 534. Ultimately, the 6000 was probably the last of the tube testers that was designed with the TV-Radio repairman For the commercial users, Western Electric (Bell System) had Hickok supply them with a Cardmatic tube tester, the Western Electric KS-15874-L2 (shown to the right.) The Hickok Cardmatic tester used hole-punched plastic cards that were inserted into a "card reader" that actuated the tester and set-up the parameters of the test. Each tube type had at least one test card and multi-element tubes would require additional cards to accomplish full testing. A large section of test cards would warrant the use of a separate carrying case just for the cards. The Military also ordered many Hickok-designed tube testers. Shown in the photo above right is the Western Electric/Hickok KS-15874-L2 Cardmatic tube tester which was the Hickok Model 1234 Cardmatic specifically built for the Bell System. Included in the lid are calibration cards, self-test cards, blank cards and a hole punch to make a special card for testing a tube where a card is not available. The manuals cover all aspects of the KS-15874-L2, including how to punch cards and what the various holes do for setting up the tube test parameters. The round object above the hole punch is the mercury cell that is used in the calibration of the tube tester. Under the louvered panel are several controls that can be adjusted if necessary. Under the black screened cover are the vacuum tubes used in the circuit of the tube tester. The separate metal box contains a complete set of test cards for most vacuum tubes. Special test cards for Western Electric tubes are stored in the small pocket to the left of the tube sockets. This KS-15874-L2 was originally used at the Bell System Coastal Station KMI located at Point Reyes, California. In fact, they had two of them. This one was given to me by KE6LNI who worked for Western Electric. Shown in the photo to the left is the civilian version Cardmatic, the Hickok 123A. This tester functions in a similar manner as the KS-15874-L2 and both testers can use the same cards for various tube tests. However, the 123A is not nearly as elaborate in construction or in features as the KS-15874-L2. The test card set is kept in the pocket at the front of the tester with binder rings keeping the cards in order in a reasonable size lot. If additional test cards became necessary then the user would have to purchase a storage box similar to the metal one shown with the KS-15874-L2. At an incredible 1960 selling price of $499.50, it seems that the 123A would have been too expensive for the typical Radio-TV repairman and more likely would have been found in a metrology laboratory or in the test department of an electronics firm. This particular 123A was a ham swap meet find that was bargain-priced at 2% of the original 123A's selling price. Hickok tube testers became the "standard" from the late-1940s up until vacuum tubes were no longer part of the electronics industry. NOTE: Regarding HICKOK Tube Testers in General - Nowadays, Hickok tube testers have once again become the standard for "used" and "NOS" vacuum tube dealers who must provide some assurance to their customers that the prospective tube to be purchased will function correctly when received. Hickoks are recognized for their ability to test most vacuum tubes accurately by measuring the tested tube's transconductance. However, one should remember that test results will probably vary somewhat from tube tester to tube tester. Also a point to consider is that there really isn't any tube tester that tests a specific tube exactly like it operates in radio or amplifier circuits. Even the best tube tester will not find all tube faults that are possible. The "final test" is always to see how the particular tube operates when in the intended circuit. Weston supplied their Model 788 as the "OQ" to the Navy during WWII. It's nearly two feet tall and weighs 35 lbs. The contract is No. NX55/3-13581 and dates from 1942. The OQ was used at radio repair depots and in areas were radio design and testing were performed by the USN. The lid slides off of the hinges if desired. Inside the compartment at the top of the OQ are 12 patch cords and the AC power cord. All connections between the tube socket panel and the analyzer/power supply/meter panel are accomplished using the patch cords. The roll-chart assumes the operator knows the tube socket pin-outs but if needed all tube pin-out data is contained in the manual. Once the operator knows what the tube pin-outs are, the patch cords are inserted from pin jack receptacles marked 1 thru 8 on the socket panel and connected to the various pin jack receptacles marked to identify each tube element on the meter panel. The tube is then inserted into the proper socket, 4-pin, 5-pin, octal, etc. The tube heater voltage is roughly set by control A and adjusted using the fine adjustment to the correct voltage as read on the left-side meter. Control B should be set to Shorts Test initially. Control C is a variable pot and is set per the roll chart data. Control D is a multi-position switch that is also set per the roll chart data. These two controls (C and D) select the correct voltage divider resistors for proper tube element voltages. The Plate Voltage is an adjustable control that is set to read "100" on the right-side meter. Meter Reset should be fully CCW to start. First the tube is tested for shorts watching the neon lamp. If no shorts are indicated then the switch is set to TEST. Now the arced center meter will read some value of plate current. Using the Meter Reset control the plate current reading is adjusted to zero. Now the Gm TEST switch is actuated and the test value mutual-conductance percentage will read on the arced meter. Diodes and rectifiers only are emission tested. The OQ-2 is not a "quick" or "easy to use" tester and requires some extra data not found on the roll chart (all required data is in the manual however.) The OQ-2 is quite a visually impressive unit that's a lot of fun to use. Shortly after WWII, the military decided to use the basic Hickok circuit for all of their tube testers. Even though the circuit might be Hickok, many other contractor companies built tube testers for the military. Each contractor company had to meet the specifications for the particular tube tester they were building. No matter what the contractor company is, the tube tester will have the same quality and will perform in the same manner. The military tube testers are generally portable and ruggedly built to withstand the rough treatment they would receive in a depot or when being taken to some remote location. The designs of some tube testers favor "simplicity of operation" which would usually speed-up the radio repair. By far the most popular military tube tester is the TV-7 series with the TV-7D/U being the most often seen. The TV-7D/U had the longest production life and had the largest number of contractors building these testers. Other popular military testers are the TV-2, TV-3, TV-10 and the WWII-era tube tester, the I-177. Calculating Transconductance from the TV-7 Meter Reading - The 0-120 scale used on the TV-7 tube testers requires using the test set up book to know whether the tube being tested is meeting minimum acceptable transconductance. Some other Hickok tube testers read out the transconductance directly. It's very easy to convert the TV-7 reading to transconductance in uMhos by knowing what the full scale settings actually are in umhos. Use the following table. Example: If the tube under test reads 70 on the B scale then 70 x 25 = 1750 uMhos. If you want to know the minimum acceptable uMhos for the tube under test then multiply the "minimum acceptable" number listed in the test book by 25 (for scale B) for the actual minimum acceptable uMhos. NOTE: Only the TV-7D has the "F" scale. The TV-7 is a compact and densely packaged piece of equipment. Some parts of the circuitry are easy to access but other areas will require some disassembly to repair. You should have the military manual TM11-6625-274-35 for testing and troubleshooting procedures along with schematics for all versions of the TV-7. There is approximately 330 vac inside the circuitry around the rectifier tubes, so care must be taken in testing some areas of the TV-7. Also, there is no connection to chassis for plate and screen voltage returns. All B+ is referenced to the cathode circuitry. The manual will direct you how to test all parts of the TV-7 and there is a troubleshooting flow chart to go through during the testing process. Once you've located the cause of the failure, the next problem is where to find replacement parts. Some of the parts are standard components and are relatively easy to find. Others will require some searching. The power transformer, for example, used to be available from Fair Radio Sales (and may still be.) Most unique parts are going to require a donor "parts set" TV-7 which will be difficult to find. Some parts can be built. For example, the diode rectifier pack for the "Line Test" function. You don't specifically need the original type of diode pack. Any pair of small silicon diodes that are rated at 300 piv will work. >>> >>> Luckily, most of the repairs are limited to the "Line Test" diode pack, worn out sockets, bad contacts (for a variety of reasons) and bad or wrong tubes. Occasionally, a bad power transformer will be the problem. With the military manual as your guide, it's pretty easy to find the problems. But, locating or building the replacement parts may prove difficult and time consuming. There are two tubes in the TV-7, a 5Y3 rectifier for the plate and screen voltages and a mercury-vapor rectifier that is part of the test bridge. These tubes are rarely a problem but, like any vacuum tube, they can loose emission or become shorted. A failure of the 5Y3 will prevent testing any tubes since there won't be any plate or screen voltage. Weak emission on the 5Y3 will cause tubes to test weak or not at all. If the 83 is defective with an open heater then the testing circuit won't function. If the 83 is shorted, the meter will be deflected to the negative side of zero. If P4 is pressed, the fuse lamp will illuminate brightly. Since the 83 is a mercury-vapor tube, a new replacement should be "burned in" before installing. This requires 5vac to be attached to the filament pins and the tube left to "heat up" for about an hour. The 83 should be in a vertical position for the "burn in." This assures that the mercury droplets are completely vaporized before the tube is put into use. Normally, the voltages are not high enough to cause an arcing problem and usually a TV-7 that has been idle for years can be powered up and a tube tested without any issues. The "burn in" is only for replacement 83 tubes of unknown operational history. The accuracy that the TV-7 provides the user is dependent on its circuitry providing the tube-under-test with specific DC and AC voltages and measuring the resulting current flow through the tube. All adjustments within the TV-7 are either locking potentiometers or wire-wound resistors with adjustable clamping slides on the TV-7A/U, TV-7B/U and the TV-7D/U versions. The older TV-7/U versions will have fixed resistors in some areas of adjustment that might need to be reselected for proper calibration. The TV-7B/U chassis is shown to the right. Equipment Needed - You will need a Variac and an Isolation Transformer for the Simulated Tube Test. You will need a known accurate DVM. Remember, you are going to be measuring both DC and AC voltages and the accuracy of the calibration is dependent on how well-calibrated your DVM is. Metrology labs require that a measuring instrument must be ten times more accurate than the specified accuracy of the device being calibrated and many of the Metrology lab instruments will have their calibration tied to the National Institute of Standards. The point being, be sure your DVM is an accurate instrument before proceeding with the TV-7 calibration. Try to use 1% resistors for this calibration. Confirm the resistor values by measurement with a known accurate digital ohm meter. The two 12K resistors are connected in parallel (for 6K) for the SHUNT test-calibration. A good vacuum tube - 6L6 is recommended - actual transconductance is not important but it should test good. For the TV-7/U you might need an adjustable resistance decade box for selecting resistor values in some of the calibration steps. It won't be necessary for the "lettered versions," TV-7A, B or D.
Use TM11-6625-274-35 (the military TV-7 Field and Depot Maintenance Manual) for the calibration procedure. This is available as a free download PDF on the "BAMA edebris" website. Tests Required - The tests performed will involve Bias Voltage Test, Plate Voltage and Line Level Test, Screen Voltage Test, Short Circuit Test, a Simulated Tube Test, Shunt Control Test and the Range C to Range B Ratio Test. Be sure to test the condition of the TV-7's 5Y3GT and 83 tubes on another tube tester before starting the TV-7's calibration. Be sure that your TV-7 is functioning correctly before performing the calibration. As with many calibrations, you'll probably find that the TV-7 under test is already "in calibration" or maybe just slightly off. Sometimes you'll just be confirming that all of the adjustments are correct. If adjustment of one of the slides is necessary just loosen the set screw enough that the slide will easily move and then use a plastic tool or insulated rod to move the slide for the proper voltage and then retighten the set screw of the clamp. Don't over-tighten, just snug is enough. On the locking pots, loosen the lock nut with a 9/16" open end wrench. Then adjust the pot for the proper voltage measurement and, while still monitoring the voltage, tighten (just snug) the lock nut. Sometimes the pot shaft will change slightly with tightening, so be sure to monitor that this doesn't happen. Photos right show the adjustments. The 6L6 Techno-myth - There's a myth that a "calibrated 6L6" is necessary for adjustment of the TV-7. The myth says that the 6L6 has to be a "new metal 6L6" that must have a "burn-in" of 30 hours on it. This is total nonsense. The 6L6 test is checking the range B (3000uMhos) to range C (6000uMhos) ratio and linearity of the scaling. It doesn't matter what the condition of the 6L6 is - it doesn't even have to be a 6L6. When the tube is set up for the test you must then adjust the Bias on the TV-7 for a full scale meter reading on Range B and then switch to Range C and note that the meter reading is exacting half scale (+/- 1/2 division.) The 6L6 was specified in the procedure because it was an easily available tube that was capable of being adjusted to read FS on Range B. Other Notes - As with any calibration, if calibration is necessary and the adjustment doesn't change the measured voltage then there is something wrong in either the test set up or in the TV-7 circuit. In most cases, when you've gotten as far as doing the calibration procedure, the TV-7 is probably already fully functional and the problem will be in the hook-up of the test equipment or the resistors used for calibration. If you've done receiver alignments or other calibrations and if you're familiar with reading and interpreting test procedure "lingo" and you have the proper instruments for calibration - then calibrating the TV-7 is pretty easy. Certainly the "lettered" versions , A, B and D, are the easiest while the "non-lettered" version is a bit more difficult. TV-2B/U - The TV-2B/U is not a Hickok tube tester. It was designed by Air King, which was a division of Hytron - a famous tube builder at the time. Later, CBS bought Hytron and the tubes produced were labeled "CBS-Hytron." The TV-2B/U is a fairly late tube tester dating from 1958 and built up to 1962. This one was built by J. H. Keeney Co.,Inc. in 1961. The TV-2 allowed the user to adjust the tube's operational parameters during testing to fully evaluate the tube's usability. Once the tube is operating in the tester, you can "fine tune" the various adjustments to exactly the levels you want. The design allowed the user to set up a tube test by referencing the tube data available in any standard tube manual. Each of the switches are labeled per the element of the tube and then the specific pin number is selectable. When a grid or plate cap is needed, "A" or "B" is offered as an optional connection via the Plate or Grid switch. The red clip lead is "A" and the black lead is "B." The white toggle switch is the "test" switch and it can be left in the "on" position (freeing up that hand) while the various voltages are adjusted to the levels desired or specified. The "Quality" meter is percent quality up to 150% with 100% being the manufacturer's specified transconductance for a new tube of type being tested. If you're in a rush, the tube can be tested using the recommended set up shown on the roll-chart and the voltage levels specified will have red indicator lines on the meter scales for ease of adjustment. The TV-2B/U is a really fun tube tester to use - but not if you're in a hurry. Using the TV-2 can easily double your tube-testing time if compared to the TV-7. But, if you think the TV-2 is too complicated to use wait until you read about the next tube testing instrument profiled below, the General Radio Type 561-D. The Type 561-D came with a wooden box that contained nine adapter sockets that plugged into the socket receptacle on the front panel. There are nine cables exiting the front panel that allow the user to interconnect the various elements of the tube-under-test to the external test equipment to apply voltages and the signal source as needed. A panel switch selects "Plate Resistance," "Mutual Conductance" or "Amplification Factor." Also, the sign of the coefficient has to be selected (+ or -) and the multiplier switches selected based on the expected range of that coefficient. The bridge is then balanced using the attenuator dials (units, tens, hundreds) and the variable capacitance balance control. The value of the coefficient is then read out on the attenuator dials with consideration of the multiplier involved. Many other factors could also be calculated from these basic measurements. The Type 561-D was (or is) for the experimenter or for those that really want to delve into vacuum tube measurements and performance. For those radio techs that consider the vacuum tube a component that either functions correctly or doesn't,...well,...a conventional tube tester might be more practical. Or, if you want really simple, the next tube checker profiled below might be the ticket. Nearly everyone - if you're over 50 years old anyway - probably remembers seeing this type of tube tester in many types of stores years ago. Drugstores were popular places to find these DIY tube testers as were variety stores, sometimes even grocery stores. Most of us remember going along with an older family member (father or older brother was common) to test all of the tubes from the family television. This was an attempt to avoid calling the local TV repairman and trying to fix the TV yourself (DIY - do it yourself.) It was expected that the user of these types of tube testers really didn't have an in-depth knowledge of TV circuitry so the DIY tube testers were designed for "easy to understand" operation, fairly accurate testing of the tube's condition and, naturally, having a rather full supply of new tubes kept in roll-out shelves in the lower section behind the locked door. Storage trays in front on the Sylvania example shown are marked "Tubes to be Tested," "Good Tubes" and "Bad Tubes." These DIY Tube Testers relied on the probability that the most common failure in a vacuum tube television was going to be the Horizontal Output tube. Generally, the tube heater would go open and you'd loose the picture but still have sound. These types of tube testers would have no trouble finding the open heater and thus solve the problem for the "DIY TV repairman." More subtle problems might prove difficult since the tube tester is essentially an emission tester. Overall, the Drugstore Tube Testers were successful enough that the sales of new tubes more than paid for its space in the store. The last time I saw one of these testers actually set up and ready to use in an actual store was about 1980 in the Thrifty Drugstore in Carson City, Nevada. This Drugstore Tube Tester wasn't located in a drugstore, however. It was located at Jerry's Furniture Store in Yerington, Nevada. Jerry Herman not only sold furniture, he repaired TVs. Everyone in town knew the tube tester was down at the furniture store. Jerry also knew that about half the time, the "DIY TV repairman" was going to find that all of the tubes tested okay but his TV still didn't work. Therefore, Jerry would get the job to find out what actually was wrong with the set. When Jerry retired, he moved to Virginia City, Nevada and lived there several years. The tube tester, along with a lot of other TV parts, radios, TVs and other things were stored in an airplane hanger at the Carson City Airport. Eventually, Jerry and his wife moved to Winnemucca, Nevada. Sometime later, Jerry's wife came to our museum (when it was open in Virginia City) and wanted to know if I'd be interested in "clearing out" all of the junk that was in the hanger since they needed to sell their airplane that was also there. I agreed and started on the clean up a couple of days later. I found out that airplane hangers are not weather-tight. Almost all of the wooden cabinet radios and TVs had been destroyed by rain and snow blowing into the hanger over the years. Fortunately, this tube tester was pushed into a corner that was out of the weather and it remained in excellent condition. I had this tube tester located in the Western Historic Radio Museum for several years. I have to say that it generated the most comments of any of the exhibits - including the 1912 Dodd Wireless Spark Station (it was second.) "I remember those!" was the usual comment that was then followed by telling a story about how they had gone down to the store with their father and tested all of the tubes in the TV and had actually "repaired" the TV. I got this same story at least once or twice a day, so I can state positively that testing tubes at the local store tube tester was a popular method that was used by lots of people over many years for "DIY TV repair." I'd guess the popularity of the Drugstore Tube Testers ran from 1955 up to about 1980. Shown in the photo to the right is the Clough-Brengle "Graphoscope" Model 126. It is a very early model that dates from before WWII. Although there are many adjustments with a multitude of controls, the "Graphoscope" (due to its age of design,) doesn't have calibrated vertical amplification or calibrated horizontal sweep. The metal loops on the top were for a leather handle and the cabinet is dark green wrinkle finish - cool. A swap meet find. RCA introduced the No. 151-1 in 1936. It featured a 1" CRT and sold for around $39. By the late thirties, RCA increased the size of the CRT to 2" and was offering the No. 151-2 for around $49. These early oscilloscopes allowed viewing the waveforms and generally being able to somewhat measure peak to peak amplitude of the waveform. This depended on whether you had a known signal amplitude to compare the measured waveform with. Sweep or Sync. was adjustable and allowed the viewed waveform to become stationary if adjusted correctly. Also, the horizontal input could be used as an external input that allows "X vs Y" waveforms to be achieved. This allowed lissajous patterns to be created to compare different frequency relationships. Also, a trapezoid pattern could be created for monitoring amplitude modulation in AM transmitters. The No. 151-2 was produced up into WWII. Allen B. DuMont was one of the early builders of "oscillographs" (as his company called them.) DuMont was involved with Westinghouse and the DeForest tube factory in the 1920s. He got into early television when he bought out Jenkins' television lab in the late-twenties. DuMont developed the cathode-ray tuning eye tube and sold the patent to RCA. As DuMont developed his televison company, of which oscillograph production was only a small part, he partnered with Paramount Pictures to supply the much-needed money to further develop his television company. The partnership wasn't without disadvantages since it gave Paramount the power to elect their own people to positions within the DuMont company hierarchy. Another problem involved FCC regulations that prevented DuMont from expanding his television broadcasting. The FCC wouldn't allow DuMont to own more than four television stations because of the involvement of Paramount (movies.) Although the DuMont network did produce a few programs through its small network, it was very limited in its success. By the 1950s, the DuMont Company was sold off in various sections. Oscillographs were produced from the early thirties to the late fifties. The Model 164-E was first offered in 1940 for about $58. It continued to be offered even after WWII with a 1949 price of around $127. Lots of controls and a little more versatility than the C-B Graphoscope shown above. Still, the 164-E is a pretty basic 'scope. Tektronix was founded in 1946 by Howard Vollum and Melvin Murdock. Originally, the company was in Portland, Oregon but a land deal in 1957 allowed the company to build a new facility in Beaverton, Oregon, which is still their headquarters location. Tektronix produced advanced design oscilloscopes that used a time-based sweep circuit allowing accurate frequency and time measurements of displayed 'scope waveforms. 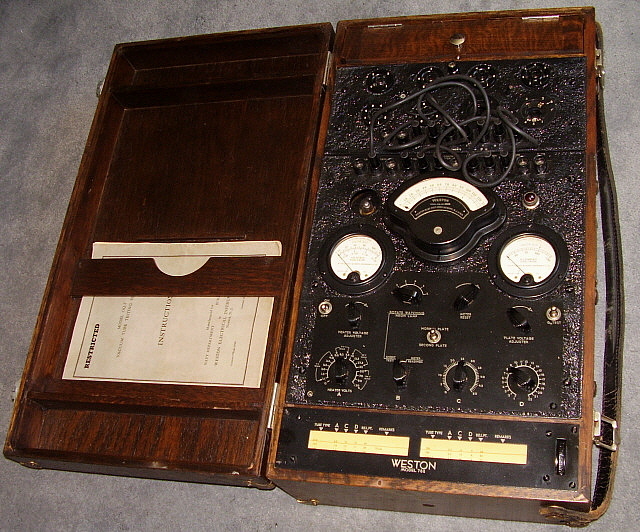 Priced around $750, the first Tektronix models were about twice the cost of the competition. However, the competition didn't have the time-based sweep circuitry, so Tektronix eventually prevailed in the industrial electronics marketplace. Generally, the electronics industry wanted Hewlett-Packard for most of their test equipment except for 'scopes with Tektronix being the favored oscilloscope. By the 1990s, Tektronix was having many financial problems that eventually required selling off some of the company divisions. After Tektronix recovered they eventually became a somewhat attractive investment and, in 2007, Tektronix was purchased by Danaher Corporation. Today, Tektronix still provides the industry will precision measurement instruments but as a subsidiary of Danaher Corp.
Around 2009, this 561B was in a "load" of test gear that I was given by a former Bently Nevada Corp. employee. He had obtained much of the test gear from various sources besides BNC over the years and had stored it all in a dusty garage. At least the garage was weather-tight but it certainly had its share of sawdust, insects, grease and sand, all of which ended up inside all of the test equipment. When the fellow delivered the load of test gear up to Virginia City (to the Western Historic Radio Museum) he specifically mentioned that the only piece of test equipment that he had "plugged-in to try it out" was this 561B. He said, "I heard a loud "snap" and then I couldn't get it to do anything. I guess I blew a transistor!" I stored the 561B with the intent to "check it out" but I never got around to it while the museum was open and while we were living in Virginia City. With the move to Dayton, Nevada, I had the time to take a look at the 561B. It was filled with fine sawdust, sand, dirt and really just about anything that could fit through the small vent holes of the cabinet. I removed the vertical amp and the time base so I was just looking at the main frame of the 'scope. I began cleaning so I could see what damage might have happened from the "snap" that had been reported. A quick cleaning didn't reveal anything unusual. I checked the power supply board components along with testing and reforming the filter capacitors. I noticed that the board-mounted 150mA fuse for the +HV was blown. I decided to test the low voltage supplies without the +HV fuse installed. All supplies came up fine and within spec. A careful power up with a new fuse installed showed that I had +HV (+3KV) although adjustment was necessary since it was out of spec (>10% high.) I think what happened was the "plug-in and power-up" performed with all of the dirt and dust inside the 561B had caused an arc of the +HV to chassis and that blew the fuse. Thorough cleaning of the main frame, the vertical amp and the time base and installation of a new power cord got the entire 561B functioning fine. Well,...maybe a few noisy pots and switches but overall working pretty good. A really nice "sharp" trace. Shown in the photo to the left is a Heathkit "5 inch Push-Pull" Oscilloscope Model O-7 that is from the mid-fifties and was owned by Howard Gates Sr. who at one time was chief engineer for Detrola Radio Co. Gates also worked for Colonial Radio and for Warwick Mfg.Co. This 'scope was given to me by his son, Howard Gates Jr. Even though this Model O-7 is from the 1950s, still most 'scopes of that time won't have calibrated amplifiers or calibrated sweep. Shown in the photo to the right is USN OS-8C/U oscilloscope. These small 'scopes were easy to carry around and very light-weight. A multitude of controls are provided but the vertical and horizontal amplifiers are not calibrated. The sweep circuit is calibrated in frequency not time. There are civilian 'scopes that appear to be close copies of the OS-8 (Waterman is one) but in reality, who copied whom? The Waterman "Pocket Scope" seems to be an early civilian version that pre-dates the OS-8. 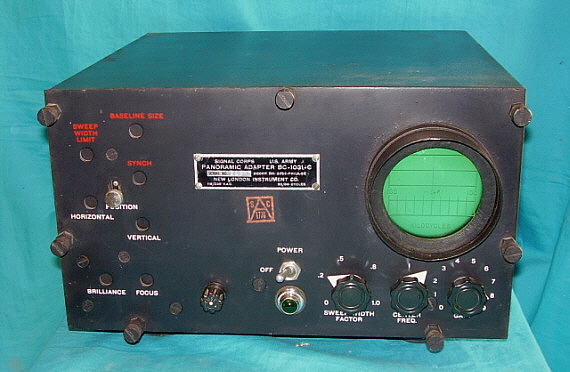 This particular OS-8C/U belonged to Al Chin who used to work on the Reno Police radio equipment. It dates from the early-sixties. The panoramic adaptor, or panadapter, is a spectrum analyzer that was specifically designed to observe the passband of a superheterodyne radio receiver. Most early panadapters were designed around the common 455kc intermediate frequency of most radio receivers. By connecting the panadapter to the plate of the vacuum tube Mixer stage of a superheterodyne (use either a high value resistor or a very small value coupling capacitor to avoid damage to the panadapter's input stage,) one can observe the widest bandwidth of the spectrum based on the sweep design maximum of the panadapter and the receiver front end selectivity. Usually about +/- 50 kc bandwidth can be observed although this is adjustable with controls on the panadapter. The original purpose of the panadapter was to allow the user to "see" signals that couldn't be heard because they were outside the receiver's IF passband. The signals would appear as positive-going peaks on a base line trace. The user could then tune the receiver to investigate the observed signal. In surveillance situations the panadapter was a useful tool. Later versions of the panadaptor were called Spectrum Display Units by Nems-Clarke and were usually paired with their VHF receivers for observing missile telemetry. Today, many modern ham transceivers that interface with computers will provide types of panadapters that allow the user to "see" the characteristics of received signals or to observe signals within a specified passband with the information displayed on the computer monitor. Shown above right is the USN RBU-2 Panoramic Radio Adapter from the WWII-era (built by Warwick Mfg. Corp.) The RBUs were used with the USN RBB and RBC receivers that used a 400kc IF. Many of the RBB and RBC receivers will have an additional tube circuit in the IF section. This is a buffer stage output to drive a panadapter. Panadapters were sometimes used to monitor a superhet receiver tuned to the 500kc emergency frequency allowing any signal near 500kc to be observed and tuned to if necessary. This RBU-2 came from KG7DVA. Shown in the photo left is the Signal Corps BC-1031-C (built by New London Instrument Co.) designed for 455kc operation. The earlier versions of the BC-1031 are black wrinkle finish but the "C" is smooth finish satin black. Generally, the chassis is heavily coated with MFP which protects much of the components and the hardware from corrosion. Most BC-1031 units will work with original parts. Be sure to check everything over before applying power. The RBU and the BC-1031 were not really designed for analyzing the characteristics of a signal. The intent was to use these panadapters to find signals that were outside the surveillance receiver's IF passband. Once seen, the operator could then tune to the signal (which was seen on the panadaptor screen as the "peak" traveling across the graduated scale to the center at which point the signal is heard in the receiver.) The operator could generally tell what kind of signal it was from the display - either CW or AM. Odd characteristics could also be spotted by the visual representation of the received signal. Detailed analysis of the modulation was difficult and not usually important. Hams used simple oscilloscopes to monitor modulation levels of their AM transmitters. National Co. offered oscilloscope monitors very early - in the mid-thirties. These monitors do not have calibrated vertical amplification or calibrated sweep. The intent was to use a sample signal from the transmitter modulator to drive the horizontal plates and to use an RF output sample to drive the vertical plates. The resulting display was a "trapezoid" if the modulation was near 100% negative and there was no distortion in the RF envelope or in the modulation. Since the voltages involved in sampling the audio modulation signal were fairly high usually an adjustable voltage divider circuit was used to adjust the input level to the monitor's horizontal plates for a good looking display. The RF input was sampled with a pick-up coil. Many transmitter and modulator problems could be easily spotted using these oscilloscope monitors. Shown above are two National Co. modulation monitors from the late-thirties. The photo left shows the CPO with a 3" CRT. The CPO came from NU6AM. The photo right shows the CRM with 1" CRT. The CRM belonged to John Ridgway W3ON. An oscilloscope-type of modulation monitor has the advantages of an instant, visual image to analyze but it is subject to interpretation by the user and requires experience to be a valuable tool. A simple, effective method of monitoring AM modulation percentage is to use a meter. Sylvania offered a very easy to use and accurate modulation meter that took advantage of their recent small packaging of the 1N34 germanium crystal diode. Prior modulation meters had used vacuum tube diodes that limited the carrier frequency response to about 30mc. With the 1N34, detection-rectification was possible to well over 55mc and could actually be relatively accurate at 145mc. In addition, no heater voltage and no plate voltage was required when using the 1N34. This allowed Sylvania to produce a modulation monitor in a very small package that only required that the user install a pick-up link-coil near a transmitter PA and to perform a few adjustments to end up with an accurate and easy to use modulation meter. The design appeared in the February 1947 issue of QST. A pick-up link of one or two turns of insulated wire with a suitable length of 75 Z ohm coax is installed in the transmitter final area and connected to the Mod Meter. With the transmitter tuned and in operation, the "METER READS" switch is placed in the RF position. The "PEAKS" switch can be in either POS. or NEG. The Mod Meter now reads the carrier level of the transmitter. The trimmer on the left side of the Mod Meter is adjusted to peak. The user then has to position the pick-up link to have the meter read "100." Link adjustment has to be done with transmitter power off. When link position results in the meter reading "100" with the transmitter set up on its operating frequency and at the desired output power then the "METER READS" toggle is switched to "AF" and the Mod Meter will read the modulation level of an AM signal. The "PEAKS" switch determines whether you measure the positive or negative going peaks. The trimmer allows for minor readjustments when changing transmitter frequency. AM Radio Broadcast stations were required to monitor the percent of modulation of their transmitter. Most modulation monitors were designed to comply with specific FCC regulations which stated the necessary requirements. The General Radio 731-A Modulation Monitor dates from about 1938. A variable capacitor tunes a pick-up inductor mounted near the tank coil of the broadcast transmitter. This input is then detected to drive the Carrier Meter. Regulated power supplies deliver reference voltages that compare the detected signal/lp filter output and give a percentage of modulation readout. Another circuit allows a variable setting of an Over Modulation warning lamp. Outputs for monitoring are accessed via a Jones Plug on the rear panel. The operator can select Positive or Negative Peaks for readout on the modulation meter. It's interesting that the Over-Modulation warning lamp is an incandescent lamp which would be rather slow to illuminate on over-modulation peaks. More modern Over-Modulation indicators used a "fast responding" neon lamp for a warning indicator. Measuring the modulation level of an FM transmitter requires special equipment. Many times it was a "maintenance" check that would require portable test equipment since the user would be checking different transmitters in different locations. Lampkin supplied the Type 205 FM Modulation Meter for the technicians that were checking and maintaining "business" and "service" transmitters, most of which were FM transmitters. This Type 205 belonged to Al Chin and his dymo-lables are still on the tuning dial bezel. Al Chin maintained the police transmitters for the city of Reno up to about 1970. The GR-761 was intended for measuring the vibration of almost anything that might have unwanted vibrating movement. This could be building frames, support beams or other structures that had resonances or other types of unwanted movement. The ability to measure vibrations could then allow the user to find the cause of the unwanted movements. Rotating machinery and case vibrations on reciprocating machinery were other possibilities. Any place that the "stinger-tip" could be pressed against could be measured for vibration. Output is in micro-inches. Push buttons allow for selecting Velocity, Acceleration or Displacement and also for scaling. Power is supplied by a single multi-tap battery. An AC receptacle is provided for using the AC line as a calibration source (not as a power source.) Selling price in 1951 was $490. One would think that there's already enough noise easily available everywhere so why have a "random noise generator?" Since the output of the Random-Noise Generator is so broad in the frequency spectrum, it becomes a useful instrument to test responses of loudspeakers or microphones. Room acoustics or filter responses. Anywhere that a very broad frequency spectrum of intentional electronic noise would provide means to measure responses without the need for sweeping frequencies or testing a specific frequency response at many points along the spectrum. The 1390-A uses a 6D4 tube as the noise generator and due the gas discharge nature of the tube and the fact that it is surrounded by a magnetic field, it produces a wide spectrum of "white noise," which is basically a "hiss-like" static. Two 6AQ5 tubes are used as a two-stage amplifier with filters between the stages. The OUTPUT control adjusts the level of noise along with the HIGH-LOW switch. The RANGE selects the filters to provide noise within this upper limit specified by the switch position. Selenium rectifiers are in the power supply and a 3-4 ballast tube is also used. Output levels are around 1.0v P-P with no load. Output Z is around 800 ohms. The output could be used to drive other equipment. Sold for $275 in the early fifties. General Radio built test instruments for sound applications in addition to RF instruments. Shown is an instrument for measuring various types of sound - actually noise, which would be a term that implied "unwanted" or "irritating" sound. Since these types of sound generally have specific audio bandwidths or might even have narrow bandwidth peaks, it would be necessary to identify where in the sound spectrum the noise was happening. The 1558-BP uses various filters that can be roughly tuned in octaves to allow the user to find where in the sound spectrum the noise was loudest and to measure the sound level of the noise in DB. A dynamic microphone was used for the input under normal conditions where the sound or noise was rather loud. Less powerful noise would require an accessory sound level meter or other device to drive the 1558-BP. The phone jack below the Cannon mic input is for a sound level meter. The 1558-BP is battery operated and uses rechargeable batteries. The charger input is the Jones' plug receptacle on the lower front panel. Some uses for this device would be measuring noise levels around aircraft or vehicles. Analysis of environmental noises in offices or factories. Studies of environmental noise as related to hearing loss or damage. As one can see from the applications, it's not surprising that this 1558-BP was property of the Utah State Department of Social Services - Environmental Dept. This is a rather late production unit from 1970. Note that the case is the General Radio style that allows the instrument to be placed in any convenient position for use and then the lid can "wrap-around" and be closed up providing a cover over the front panel and a carrying handle. Also, these late-production instruments have gray knobs and panels and generally use much more plastic in the dials and meter cases than the earlier GR instruments. I didn't know whether to include this instrument or not. It's not really "test gear" but it is interesting and it is vacuum tube circuitry so at least it's vintage. Prospecting for uranium was somewhat popular in the early 1950s and Nevada was the perfect place to go looking. Maybe not rich in uranium but with wide-open spaces nobody was going to bother you as you wandered around the desert checking out different rocks and deposits with your little "hand-held" geiger counter with your headset on. Battery operated using two D cells for the filaments and two 45vdc B batteries in series for the plates of the two 1U5 vacuum tubes. Also, a 1B85 "pick up tube" and a CK1038 (appears to be a neon bulb) are in the circuit. The holes in the bottom and side of the case are to allow the uranium radiation to hit the "pick up tube" and cause "clicking" in the phones and some meter movement. All great fun and at the very least it was great exercise and got you out into the Nevada desert sun. This U-238 belonged to John Ridgway W3ON and I don't think that he ever found any uranium with this instrument. I also got a couple of books from John on uranium prospecting and on this instrument. I haven't powered up the U-238 yet - but it's tempting. Here's another interesting test instrument that's not really for testing electronic devices but does employ vacuum tubes in its circuitry and it is vintage. It's a CONN Strobo Tuner, a device for precisely setting temperament when tuning keyboard instruments, especially pianos. Around the time of J. S. Bach, "Equal Temperament" was introduced and was popularized by Bach. Equal Temperament spread a pre-set error within the tuning that was hardly noticeable. By slightly flattening the fifths and sharpening the thirds, a keyboard performer (or composer) could play in any key without retuning the instrument. Bach composed "The Well-Tempered Clavichord" as a demonstration piece that featured 24 preludes composed in the 12 major and 12 related minor keys to show that Equal Temperament worked and allowed greater variety in how music would be composed and performed in the future. So much for the history of how keyboard instruments were tuned. Since tuning a piano or other keyboard instrument required the tuner to judge just how much to flatten the fifths, all keyboard tuning was slightly different depending on the ability and the method used by the tuner. Enter the CONN Strobo Tuner. By using various frequency oscillators that beat (heterodyne) against the incoming piano note (picked up by the microphone) a rotating strobe wheel is observed through the central window in the panel. The pattern appears to rotate in one direction if the note is flat and the other direction if sharp. When the note is in tune, the strobe pattern appears stationary. >>> However, just to complicate matters of pitch,...what is "flat" and what is "sharp?" The note of A440hz hasn't always been the standard pitch. In the late-nineteenth and early- twentieth century the standard was A430hz. In Bach's time, A was about 415hz, which is about a semitone flat from A440. If Bach heard his music played today, at today's standard pitch, it would sound like it was being played in a different key to him. His C major Prelude would sound like it was being played in C# major. What this all goes to show is that music has always been evolving,...from the way keyboard instruments are tuned to the exact pitch that we take for granted today. The ST4 shown is from the late-fifties or early-sixties. Since the Strobo Tuner is loaded with paper capacitors to set the frequency of each of the twelve oscillator "tones" it's likely that most of these vintage Strobo Tuners can't be relied upon for accurate setting of temperament when operated "as-is." The crystal microphones generally aren't functional either since rough treatment was the norm for these tuners. If you plan on using a vintage Strobo Tuner, verify the oscillator frequencies for all twelve tones. Don't haphazardly replace all of the capacitors and expect the frequencies to be correct - you have to check them. To fully rebuild a vintage Strobo Tuner will require accurate test equipment to verify correct operation afterwards. Not to worry though, modern solid-state Strobo Tuners are available.